Jill Deupi at Lowe Art Museum. Photo: Nick Garcia. While attending a lecture by National Geographic photographer Chris Rainier at the Lowe Art Museum, I ran into a classically dressed woman with a modest Audrey Hepburn hairstyle. I would soon find out that this woman was Dr. Jill Deupi, who became the new Beaux Arts Director and Chief Curator of the Lowe Art Museum in August, 2014. Following Rainierâ€™s lecture, I made a point of introducing myself to Dr. Deupi. Through our conversation, I learned that she had an interest in law and had even passed the bar exam. 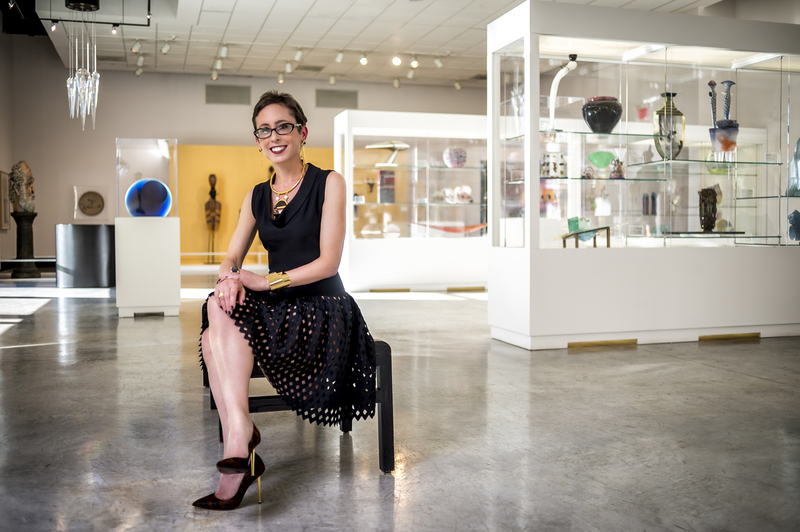 Despite her legal background, she pursued her passion for the arts and now was happily overseeing the collection at the Lowe Art Museum. This struck a chord with me, as I am currently a paralegal, but I have an immense interest in art history. Dr. Deupi gave me her card and we agreed to speak again. Keena Roye: When we last spoke, you mentioned that you went to law school, but you eventually realized you wanted to work in the field of fine arts. What was your first job at a museum? Jill Deupi: Just after I finished law school and took the bar exam in Virginia, my husband got a new job in London and we moved. I think it was literally within that same week of my having sat for the bar exam. We moved to London and that was the perfect opportunity for me to start over in a new field. I was qualified to work in a law firm, but not very qualified to work in a museum. I started on the bottom rung, volunteering at the Royal Academy of Arts in London. Their volunteer organization is called the â€œFriends of the Royal Academy.â€ I started out serving tea and filling out membership cards, which gives you a sense of the depth of my commitment to the arts. Fortunately that did not last very long, maybe four to six weeks. A position opened up in Finance and Administration. As much as I love the arts, I was not qualified to be working in education or curatorial at that point. So I was the Assistant to the Director of Finance and Administration, and my job consisted of looking at contracts and having to rewrite pension and benefits, things like that. Eventually I migrated over to being the assistant for what is called the â€œSecretary,â€ which is really the Director. His name is David Gordon. He is a wonderful museum professional who actually had just come over from the business world at that point to work in the arts.Â I worked for David Gordon for two years and learned a lot.Â Heâ€™s still a great friend and mentor. I totally drank the Kool-Aid. I was working in a beautiful 18th-century building in one of whatâ€™s called â€œthe Great Rooms.â€ I was completely smitten by museum culture and everything that it entails. While I was working at the Academy I also earned my Masters Degree at Birkbeck College, which is part of the University of London system. Birkbeck is designed specifically for working professionals. It was a perfect fit for me. That was the beginning of my new career trajectory. KR: When did you realize that you wanted to be a Director of a museum? JD: I think, like many women, I suffer from whatâ€™s called â€œImposter Syndrome.â€ You think that youâ€™re far less worthy than other people think you are. Honestly, I never in my wildest dreams thought that I would ever become a museum Director. It just never occurred to me. I was doing what I loved. I followed my passion and I was working incredibly hard. When I found myself in the position to become the museum Director at Fairfield University, I suddenly realized that this was the perfect nexus for me of my administrative-legal business side and my art historical-curatorial side. The job really found me. I was much more modest in my ambitions. KR: What has been the biggest obstacle you have had to overcome in your career? JD: Thatâ€™s a good question. I think work-life balance is still a really tough one. I have three school-aged children and my husband is terrific. Heâ€™s a professor at the University of Miami, so his schedule is a little more flexible than mine. Heâ€™s been terrific about picking up the slack. Iâ€™m at the Lowe Museum 50 to 60 hours every week. When I go home, itâ€™s to another full time job. I think that is by far the most difficult obstacle, for any working family, not just for me personally. In terms of career obstacles, Iâ€™ve been very lucky not to have any major obstacles. Perhaps because Iâ€™ve taken my time and been very methodical, even though I didnâ€™t quite know where I was going in my career trajectory. I had to take my time and think things through very carefully before I made any significant decisions. KR: In your career, have you ever encountered a controversial exhibit that you felt uncomfortable displaying? JD: I have not, but interestingly enough, when I was at the Academy in the mid-1990s, there was a show called â€œSensation,â€ which made a big ruckus when it traveled to Brooklyn while Rudy Giuliani was Mayor of New York. Â The exhibition was a problem because Chris Ofili, an African-American artist, had incorporated elephant dung and some pornographic images into a collage he made that represented the Virgin Mary. The Right Wing went crazy because the exhibition was using Federal NEA taxpayer dollars that had been used to support the museum, as well as city subsidies and other public resources. What I found really fascinating was that across the Atlantic, when that show opened, it was the premier event at the Royal Academy. Everyone paid attention, but no one thought twice about Ofiliâ€™s piece. Instead it was a portrait by Marcus Harvey of a heinous child-murderer named Myra Hindley whom the press labeled â€œthe most evil woman in Britain,â€ that caused a complete uproar. Hindley and her accomplice Ian Brady were known as â€œThe Moors Murderers.â€Â Someone threw eggs at Harveyâ€™s portrait of Hindley. I also remember that someone tried to slash it with a knife. It was fascinating to me to see how the exact same show, more or less, could be received so differently by different communities, causing outrage in both instances, but with very different triggers. It was very clarifying about the subjectivity of our viewpoints and how cultural norms affect how we respond to art. KR: Do you try to make art? JD: Not at all, but I make a mean stick figure.Â For me, art history is a manifestation of cultural history. Iâ€™m a contextualist, if thatâ€™s the word, when it comes to my approach as a scholar. Part of it is because I am a scholar of the 18th century and Iâ€™m reading contextually, not just looking at objects, but learning about the history of the artists of that era and earlier. I believe that art is an expression of the zeitgeist, determined by where a person is both individually and as a member of the collective society. KR: Is there a difference between the artwork that you think will do well at a University Museum as opposed to work that you personally enjoy? Or do you choose exhibits based on what you believe the audience will enjoy? JD: I choose things that I think have broad appeal. We are the oldest collecting art museum in the region with an encyclopedic collection of almost 19,000 objects. I am very proud of that.Â I like to exhibit art that connects to the identity of our audience and makes it relevant, for example, the work of Vik Muniz, whom we exhibited in the Spring of 2015. Muniz is clearly interrogating canonical art history and responding to affirmed masterworks. These sorts of shows, I think, are right in the Loweâ€™s sweet spot. These are the kind of artists and the kind of exhibitions Iâ€™m interested in. KR: Given Miamiâ€™s diverse ethnic population, does this diversity affect the artwork that you choose to highlight? JD: Absolutely. One of the things weâ€™re very interested in doing is a proper audience survey. Iâ€™m very curious to know whom weâ€™re serving. Iâ€™m even more curious to know whom weâ€™re not serving and why. I am sure that there are many segments of our population who are not coming to the Lowe on a regular basis. There are a variety of reasons, most obviously economic, but also time, transportation, linguistic barriers, or a feeling of not being equipped to view art or being welcomed by the museum. One of the exhibitions that we had in the Fall was a show devoted to the art of Haiti, drawn from the permanent collection. We were able, thanks to the generosity of a donor, to provide 800 free admissions. We gave away these complimentary tickets strategically to the Little Haiti Cultural Center and to the Haitian Historical Society in North Miami, to distribute as they saw fit. Â We wanted to make sure that those segments of Miami society, whom we thought would really benefit from the show, would be encouraged to come to the Lowe.